NorCal Resources Rock – Glass Half Full with Leslie Krongold, Ed.D. I am so grateful for the move I made to Northern California in 1989…even if it included experiencing the Loma Prieta earthquake. This is really one of the most inclusive areas in our country, especially for people with disabilities. I know of a family that relocated to California from the Midwest so their severely disabled son could reap the benefits of the Regional Center’s services as well as other state resources. 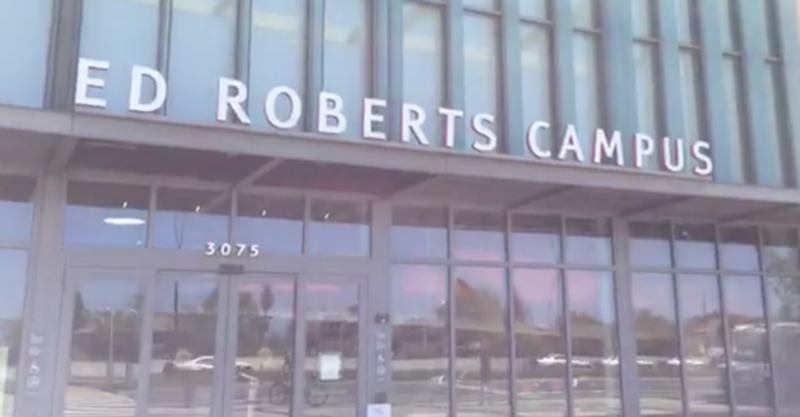 And the Ed Roberts Campus (ERC) is definitely one of the amazing resources. Located in Berkeley, California — across from a major public transportation hub — ERC houses a number of federal, regional, state, and nonprofit organizations providing services and resources for people with physical and/or developmental disabilities. Located at a fully accessible transit hub, the Ed Roberts Campus is a national and international model dedicated to disability rights and universal access. Yesterday I attended the Momentum Expo sponsored by the Center for Independent Living. Here’s a short video I shot while at the Expo. The event was free. I had the chance to find out more about new and existing organizations, promote the podcast, and see friends I know from various aspects of the Northern California disabled community. One organization housed at ERC is BORP: Bay Area Outreach & Recreation Programs. BORP has an adaptive fitness studio at ERC where I take classes. In fact, Valerie Jew’s Integrative Healing class is there. Lately I’ve been attending a World Dance for All class held in the BORP fitness studio. The next podcast episode is all about Dancing so you’ll soon hear more about this class.